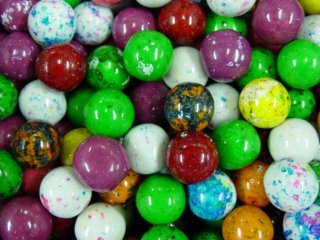 I miss good gumballs. The ones that look normal on the outside... all shiny and sweet, but on the inside are those sour crystals. There's the ones that are sour on the outside, with all the sour stuff caked on 'em so you know what you're gettin', but I like the ones that look regular. They are a rare find around here. It's been years since I've found any. I've even looked on the 'net, but they aren't to be found. Normal gumballs are still good, but you can get those anywhere.